Close to the old cornmill known as Cross Mill in the watermeadows of the St Cross area of Winchester, the River Itchen flows through the tranquil valley. With crystal clear water stocked with many brown trout the water plants and flowers swirl in the current as kingfishers dart into the glittering surface. This private commission was for three stained glass panels, two for the doorway and one side panel for the entrance to the Games Room at the riverside Cross Mill, Winchester, Hampshire UK. Brown trout can be glimpsed in the flowing waters of the river, and a kingfisher flies up to overhanging branches of autumn leaves with his catch. The trout fishing season in the River Test runs from March to October, and so the snowdrops and autumn leaves mark the beginning and close of this time for sportsmen. 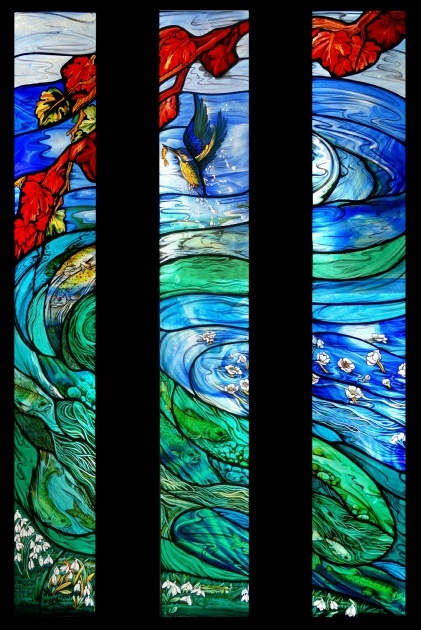 “I wanted to use the natural flow and bubble texture of English antique streaky glass, and I also cut glass from sheets of French St Just Bariole hand blown, and selected from interesting blue/green mixed colours, and then etched the glass to reveal areas where I could paint the fish and water weeds. This gave the impression of depths of colour through which the fish seem to swim, partly visible through the water weeds. Some sheets of Lamberts German streaky antique glass also added to the vibrancy of the work. I love the subtle effects that can be achieved through traditional etching with acid, a tricky and hazardous process and a great deal of patience is needed, but the end result is matchless. The kingfisher was etched from a streaky blue and clear, and silver stained with yellows to achieve a range of cobalt to yellow through shades of green and turquoise. Water droplets stream off as the kingfisher emerges from the river with his catch, a tiny moment of time and drama captured.